Applique is everywhere. Baby items, children's clothing, quilting, towels, sports clothing; just about anthing. It's always been one of those things that I was going to learn but never got around to. 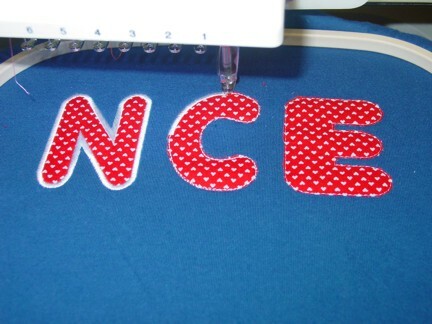 I always felt that maybe applique could be an affordable option for clubs or group logos since a good size "back" logo could be anywhere from 20,000 to 100,000 stitches, well, the cost of embroidery can really add up. So this year, I did it. What I found is that applique has less of a stitch count, but time wise it's not exactly quicker. Lots of trimming which can be very time consuming. I had a customer come in with a toddler's t-shirt that she had done at a craft faire. It wasn't the type of applique that one normally sees on a garment, it was untrimmed and would ravel in time around the edges. It was kind of a cute concept and the result is below. The next applique project was for a mom of twins that are starting school this year. 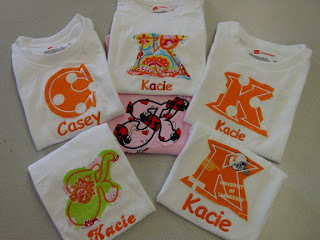 She wanted the initials of the school appliqued on t-shirts for the girls birthday. Step one: fabric of choice and garment. I learned from the first project that if the print on the fabric is too large it will most likely get lost in the corral of embroidery. 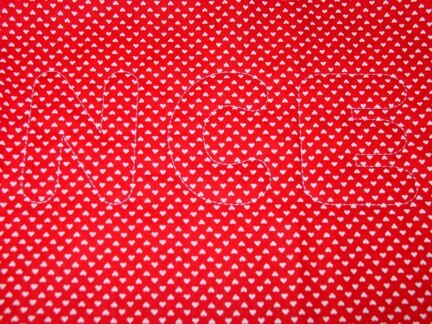 I was glad when the young mom brought over fabric that would be small enough to fit in the confines of the stitching. Step two: The fabric was backed with a product called Wonder Under. 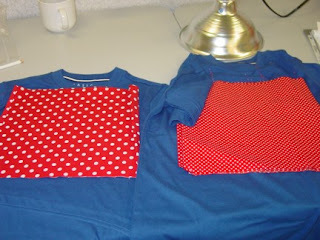 I used spray adhesive to secure it to the fabric then I laid the fabric on the t-shirt and hooped it. 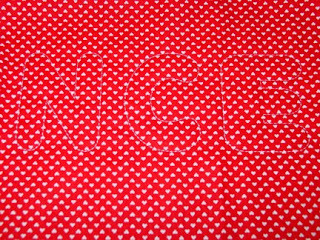 A single line was used to secure the fabric to the t-shirt. You'll have to look really close to see it. Step three: Trim. This I found tedious. Some people print out a pattern of the stitch and cut it out and then lay it on the garment and then put the final stitching around the edges. I have not been brave enough to attempt this since I am worried that the fabric will move or the machine burps and then I have a ruined garment that I might not be able to replace. During the trimming process you can't pull too hard on the excess or the applique fabric may ravel and you have to trim it close it enough to the edges won't poke out of the final satin stitch. 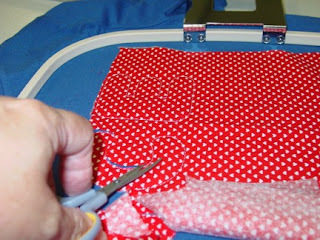 Step four: Let the final stitching begin. And the final product. 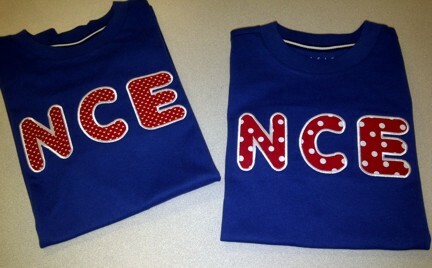 The customer loved the shirts. I'm excited about these new projects. Check back for more. That handicraft work looks really good on these sports shirts, Great job.